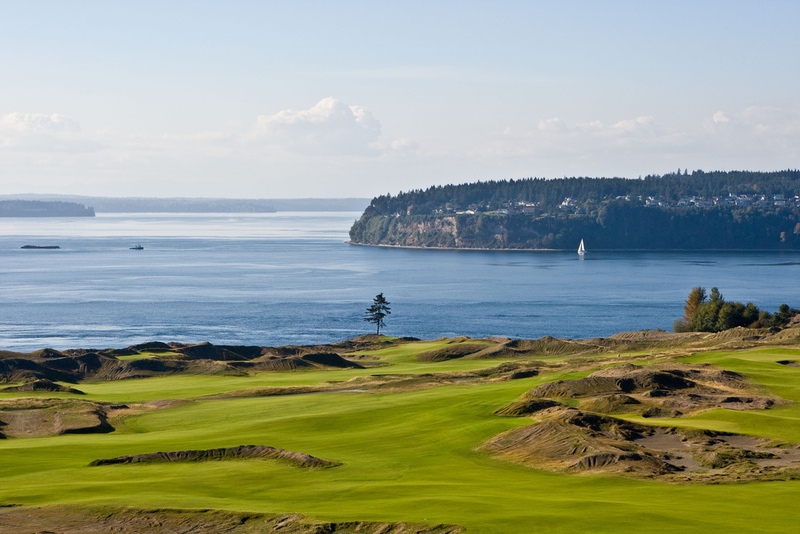 The prevailing view of this year's U.S. Open is that it's going to play more like a British Open due to the hard fast layout of Chambers Bay. It's hard not to buy-in to that notion when you see pictures of the course which looks like it could have been transplanted from the Scottish countryside and run through the plastic surgeon's office to add a bunch of mounds and elevation changes. The result is that we're hearing a lot of the typical pre-British Open style chatter about how mastering the course is going to take a lot of "creativity" and that a strong short game will be required from the winner. Let's deal with the short game requirement first. Not to minimize its value but short game opportunities result from missed fairways and greens while U.S. Open winners tend to hit a lot of fairways and greens. End of short game argument. (I think you just minimized it). Seriously, remember last year at Pinehurst when the experts kept telling us how the successful player would be the one who was able to get up and down from around the treacherous greens and then Martin Kaymer just came out and started splitting fairways, hitting greens and had Donald Ross ready to rise from the grave and go White Walker* on him? For that matter, take a look at the recent list of major winners and tell me the last time we saw a scrappy scrambler type finish on top. Maybe Graeme McDowell at the 2010 U.S. Open? Since then it's been a fairly steady diet of ball strikers like Rory McIlroy (4), Bubba Watson (2), Kaymer (2), Justin Rose, Adam Scott, etc. I guess you could make a case for Phil Mickelson at the 2013 British Open but, if you recall, he won that with some phenomenal iron shots on Sunday and you also had Scott, Lee Westwood and Henrik Stenson in the top three . . . none of whom would be in the conversation for players you'd pick to get up and down if your kid's hamster's life depended on it ("sorry Bobby, I should have picked a better putter"). So what about a player who possesses a great deal of "creativity?" Well first let's define "creativity" as it applies to a golfer. A creative golfer is one who hits a lot of high risk and, in some cases, completely idiotic shots that may yield a high reward but occasionally result in disaster. Mickelson is obviously the poster boy for creative golfers with his 6-iron from the pine straw at Augusta and his driver off the tee on the 72nd hole at Winged Foot being the bookends of his creative spectrum. Historically, the creative golfer has rarely been rewarded at the U.S. Open but that began to change a few years ago when guys like Angel Cabrera, McIlroy and Rose started winning it. Before that, it was pretty much a zombie Apocalypse of grinders like Retief Goosen, Lee Janzen, Curtis Strange and Andy North, all of whom won twice (TWICE!!!) so give USGA Executive Director Mike Davis some credit for adjusting the set-up to give guys who don't hit 80% of the fairways a shot. And this year is no different. From what little we really know about Chambers Bay, it actually seems to be good fit for Mickelson. 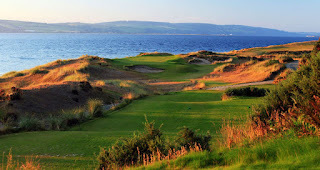 In fact, it looks an awful lot like Castle Stuart Golf Links where he won the 2013 Scottish Open. (If you were a real conspiracy theorist, you might even suggest that the USGA has set the course up in Mickelson's favor on purpose but that would be crazy talk right? Right?). His game is in great shape coming off a tie for 3rd at the St. Jude last week, a tie for 4th at the Wells Fargo three weeks ago and a tie for 2nd at the Masters. I know all of this star alignment may not ultimately amount to jack squat but, if this is finally Mickelson's time, I'm going to be holding his winning ticket to enjoy it. Quiz time. 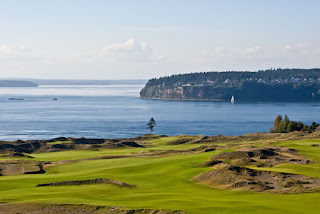 Which one is Chambers Bay . . .
. . . and which one is Castle Stuart? At the same time, it's really hard not to pick Jordan Spieth and the only reason I'm staying away is the fact that I can't picture a player winning consecutive majors with the depth of talent in the game right now and the unpredictable nature of Chambers Bay. I'm not sure Spieth is currently wired to deal with some of the bad breaks he's going to get. Take it from one hot head evaluating another. You can hold it together for 18 holes when the ball isn't bouncing your way, maybe t36 but 72 holes of it will make your head explode unless you're used to shrugging off bad breaks and stupid shots with a goofy smile (see this week's One and Done Pick). 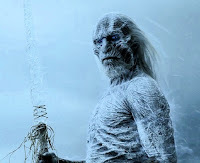 * Game of Thrones reference for those not in the know and if you've decided not to get on board just because you're sick of the hype . . . your loss. ** Just kidding. 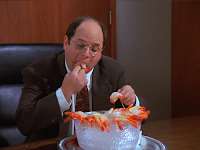 Jason Day has not been diagnosed with scurvy . . . yet.